Oxfordshire, Gloucestershire, Wiltshire, The Costwolds, Berkshire, Hampshire, Dorset, Hertfordshire, Buckinghamshire, West Sussex, and Somerset. When creating a home to suit you in terms of design, budget and lifestyle, Goose Joinery can meet all your needs. If you are a self builder or just looking to upgrade your existing property then Goose Joinery could help with all your requirements. Windows & Doors – We can supply manufactured Rationel windows and doors (the beauty of a real timber window with the maintenance application of a PVC window) or purpose made windows and doors, (traditionally hand made by craftsmen in our very own workshop). Staircases – We can plan and design you any staircase drawn in 3D from helical to straight flights. Kitchens – We can plan and design you a kitchen drawn in 3D, add appliances such as Fisher & Paykel, Neff, Bosch, Franke and install. Based in Carterton, near Witney, Oxfordshire, Goose Joinery have been providing a bespoke joinery service in the Cotswolds, Oxfordshire and Gloucestershire area for over 25 years. We pride ourselves on quality first, supported by a prompt, reliable and friendly service. 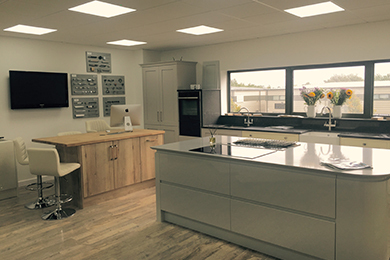 We are very proud of our new Carterton showroom and would love to welcome you for a visit, it contains a wide selection of our product ranges for you to browse through. We can offer a personal service where you can discuss all your project requirements and options. So if you are after….